The Weekly DiScussion: Have we lost our stomach for intelligent debate? You may be aware that Morrissey, former lead singer and lyricist of The Smiths, social commentator and seller of newspapers has been dropped into a rather public debate on the topics of Englishness, immigration and cultural identity. Well, it wasn't actually a debate, was it? To this writer and singular brain, it seemed like a headline with a number of eyebrow raising comments attached. A news story with an interview tacked on. Of course, Morrissey has been here before; sometime around 1992 where it all came to a head with a Union Jack flag and a Madness support slot. So you would have thought he might have been a tad cautious about even muttering the word 'immigration', let alone passing comment upon it. Perhaps though, he doesn't care. I've been told by many that when you get to a certain age, a certain point in life, you stop worrying about who's going to judge you because it doesn't matter anymore. What he must have been aware of though, was that his statements would be debated. Or not. For there doesn't seem to be much debate about anything, anymore. More a series of screaming headlines found daily on your newspaper or website of choice, condemning people for actions, thoughts or words that dare to be different or out of step with the common consensus. Which is worrying because, aside from the rather obvious point that the common consensus isn't necessarily right, it means that we as a nation (let's concentrate on the United Kingdom here) are going down the pan. In what's rather like a 24-hour media judge, jury and executioner; statements deemed inflammatory are inflamed substantially more, outraged reactions are reported on, photos are posted, a statement is made in the Houses of Parliament and then, somewhere down the line, people might, just might sit down and discuss things. But probably not. It's not as much fun as waving your fist, jaw slackened with a line of spittle emerging from it. And that's a rather lot more easy too. I'm not convinced we can actually think about these things. When people intimate views that sit outside the ever-narrowing guidelines of what a media-governed society dictates, it appears that a 'flay em first, hang 'em high, discuss it at the funeral' policy is the required course of action. The government for allowing the media to control the thoughts and opinions of a nation so thoroughly, sinisterly and downright dangerously. You for reading your newspapers, your free-in-the-morning daily rags filled with their charmless, poisonous filth. Those you gobble up daily with unquestioning gusto. You as may as well insert the computer chip into the brain now. If someone gave you a free out-of-date carton of milk, would you drink it just because? The media. But they can't be blamed; it's a growth industry, and, um, see the above. That’s if your average top three-selling newspaper will even discuss immigration and the removal of 'traditional British ways'. Unless they're lambasting Jade Goody for being a terrible racist, of course. While commenting that she's also fat and ugly. And her mum is a one-armed lesbian. This is very important. We demand things very quickly now. Perhaps there isn't time any more for people to think, disseminate and discuss. Even now, this article is being written on the hoof following a day of chin stroking, message board perusing and magazine reading. Did you see the story this week about the Oxford Union debate being disrupted by outraged activists? Holocaust denier and historian David Irving and Nick Griffin, leader of the BNP, were invited to the famous union to discuss their views. The irony being, that regardless of the reprehensibility of these people, those who strive to stop them airing their views in an organised debate had looks on their faces that were far more worrying. Of course, a similar event emerged a short while ago when Martin Amis, a professor of English, aired views on Muslims and the Islamist society that were far more inflammatory, pointed and, I would suggest, ill-judged than anything you have read in a music newspaper today. But strangely enough, apart from a series of articles in a left-wing broadsheet, it made very few headlines. Maybe that's because the Editors of those high-circulation newspapers were worried that its readers might not have heard of Amis. He hasn't been seen rolling of Boujis nightclub at 2am, after all. On another note; would it be heresy to suggest music might actually benefit from a few outspoken conservative figures capable of engaging the wet-blanket, down-with-famine liberal pop hegemony? That’s not a loaded question; I mean really would it? Search your soul; could you bring yourself to support the music of someone with known Conservative allegiances? Surely not all centre or even right-wing sensibilities are premised on prejudice and misinformation? 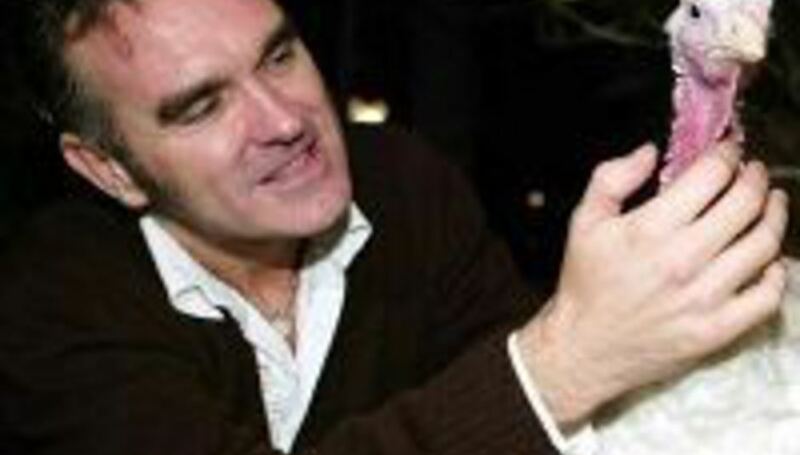 Moreover, why are we still looking to Morrissey to speak out on such subjects? Does being a rock star entail subscribing to an increasingly narrow set of vaguely leftist principles, themselves based on a few tokenistic hot topics of the day? Gareth Dobson has not requested for his name to be removed from this article.